There are going to be horse extraction demos at the Wild About Wood weekend I’m working at this weekend – I don’t expect it to snow though, or for the horses to be so burdened! 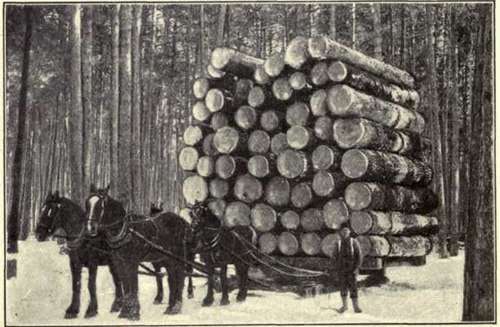 The chapter whence this photo comes is a fascinating brief overview of heavy logging in North West (?) America around the turn of the 20th century. No chainsaws. 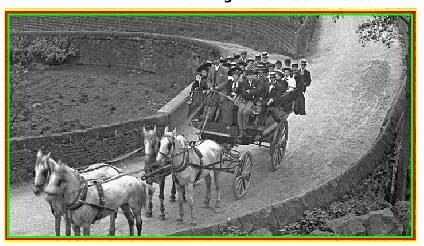 And if you think the horses are somewhat overloaded – look at these poor beasts – must be about 20 people on there, and they are going from Hebden Bridge Station to Hardcastle Crags’ Gibson Mill, which is by no means a level journey!